You just need to crush some Oreos in a food processor. I actually used my Blendtec machine and it worked fine. I used Double Stuf Oreos, but you can use the regular Oreos. 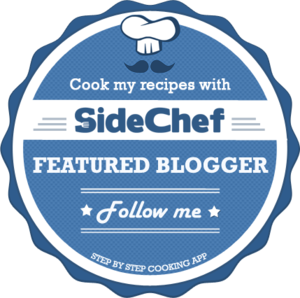 I softened up the cream cheese first in my stand mixer, but you can also use a hand mixer. I did notice that the Double Stuf Oreos made for a softer dough, but once I froze them, they were still easy to work with. I only froze them for an hour and it was just enough time for them to harden up a bit and still be able to put the sticks in. I used Wilton's lollipop sticks and Wilton's dark chocolate candy melt. 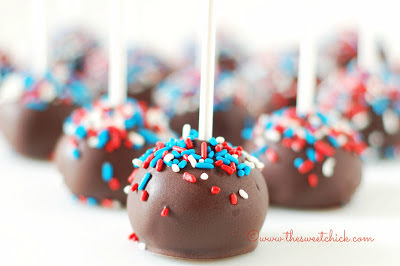 Since these were for 4th of July I used red, white and blue sprinkles. It usually is best to dip the sticks in candy melt before inserted them in the Oreo balls. They will stay in better. By the time I had finished putting the last stick, the candy melt on the first stick had already hardened so I was able to start dipping. Just dip, twirl a little to remove excess chocolate and then set in down on wax paper or parchment paper. Don't worry if you get a little chocolate on the stick. I wipe it off with a damp cloth. Then just add some sprinkles and let the chocolate melt harden. If you notice that too much chocolate is pooling around the bottom of your truffle, just pick it up and move it to another spot on your paper. I had to do that a few times. In a stand mixer or with a hand mixer, mix the cream cheese until softened. Then add the crushed Oreos a little at a time until well incorporated and the mixture becomes a dough like consistency. Roll Oreo mixture into 1 inch balls and place in airtight container lined with wax paper. Place the container in the freezer for at least 1 hour to set. After the balls are set, place candy melt in a glass container and melt in the microwave as per directions on package (30 second intervals , stirring in between). Remove Oreo balls from the freezer. Dip the tip of each lollipop stick in the candy melt and insert sticks into each ball. When the candy melt has hardened, pick up by the stick and dip the Oreo balls into candy coating until all covered. Once covered, remove and softly tap and rotate until excess candy melt falls off. Don't tap too hard or the Oreo ball will fall off, too. Then place pops on wax paper, stick facing upwards. Add sprinkles before the candy melt hardens. Once the candy melt has hardened you are free to eat one! Do try to place the rest in an airtight container and store in the fridge for your party. 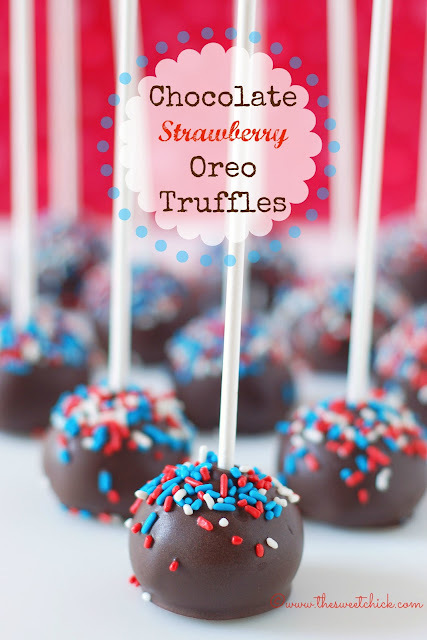 What a fun twist to the classic Oreo truffle. I love chocolate and strawberry together!! Thanks for stopping by Cheryl. I will try to make it to the party. Thank you Deb, I will go check it out. Do you blend the Oreos with their white filling or remove prior to blending? Thanks! You use Oreos in there entirety, cream and all. No wasting here.